Like many newer dSLR cameras, the Nikon D3100 offers Live View, which uses the monitor as the viewfinder when shooting photos. Turning on Live View is also the first part of the process of shooting video; in fact, you must use the monitor instead of the viewfinder when you shoot movies. Switching to Live View mode: Move the lever on the Live View switch to the right and release it. When you do this, you hear a click as the internal mirror that normally sends the image from the lens to the viewfinder flips up, allowing the Live View preview to start. Then the scene in front of the lens appears on the monitor, and you no longer can see anything in the viewfinder. Quick Settings screen: Press the Info Edit button to access the Quick Settings screen; press again to return to the Live View display after you adjust settings. Menus: When you press the Menu button, the camera exits Live View mode and displays the normal menu screen. You must rotate the Live View switch to return to Live View mode after you select the options you want to use. Shooting photos: Things work the same as for viewfinder photography, with the exception of focusing. Recording movies: Press the red movie button to start and stop recording. Exiting Live View mode: Rotate the Live View switch or press the Menu or Playback button. 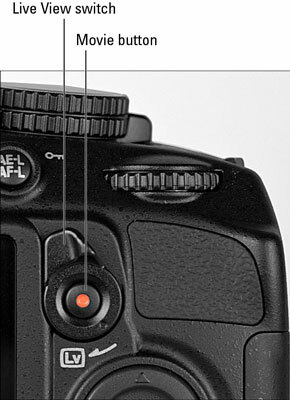 The D3100 also automatically disables Live View if you turn the camera off and on again.